Enter the world of Graflex. The Folmer & Schwing Manufacturing Company, New York, produced several types of cameras before it was purchased by the Kodak Company in 1905. From then on, the Folmer & Schwing produced a limited scale of models until it became independent again in 1926 as the Folmer Graflex Corporation. In this period the company enjoyed its pre-eminence over all competitors in the production of professional photographic equipment. The next pages show several types of press cameras from my collection, produced in the late thirties till the sixties from the last century. Apart from that I added a few pages with the earlier type press cameras like the Super D, Series B, Graflex 3A, Auto Graflex Junior National etc, etc. For three decades, from the 1930s and ending in the '50s, the Speed Graphic camera was synonymous with photojournalism. When war came, the camera found new and important uses as a weapon. 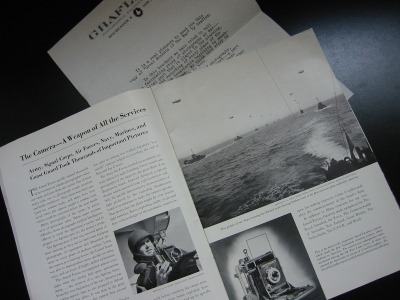 Graflex equipment became "fighting equipment" in all phases and theaters of the war. In the air, the reconnaissance camera became an essential weapon, searching out enemy troop movements and fortifications, showing bomb damage by day or night and selecting new military targets. These new photographic developments that have come out the war, was soon available for the professional photographer. Even the super huge Kodak Aero reconnaissance lens found a new application and is still loved by the creative, artistic and not work-shy photographer. The Pacemaker Speed Graphic equipped with a Kodak Ektar 127 mm in a Super-matic M-F shutter powered by a solenoid. 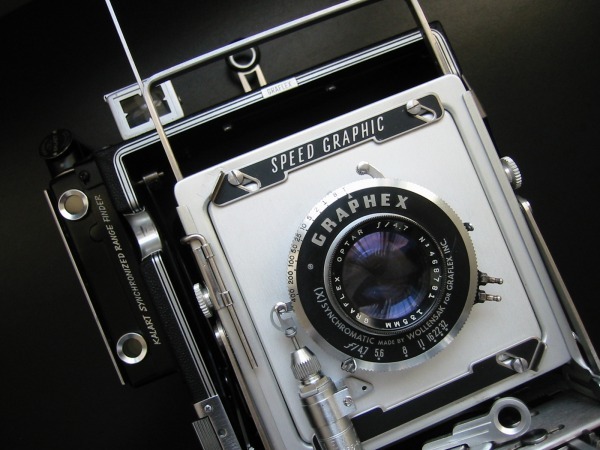 From the in 1907 introduced Graflex Press Camera, up to the Pacemakers Speed Graphic in the sixties, Graflex cameras witnessed conflicts all over the world during the 20th Century. 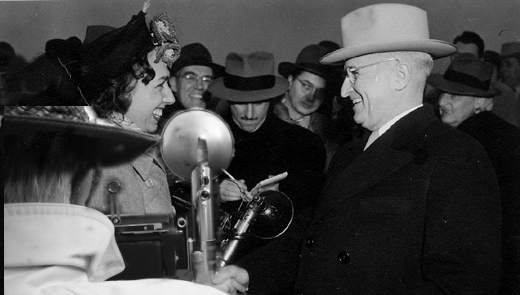 These reliable cameras, precious instruments of famous press photographers such as Weegee, took pictures of G- men in Chicago, armed conflicts, wars, student revolutions, and civil disturbances. They covered the Nuremberg trial, the Korea war, and the assassination of Lee Harvey Oswald who killed president Kennedy. At the end of the sixties, Graflex cameras were still present on most of the theaters of historical events, but their number decreased as if it was as a last salute to the end of a photographic period of time, where Large Format cameras such as the Speed Graphic dominated the scene there where the event took place, to be succeeded by the smaller, absolutely faster, maybe fancier but never impressing, Japanese 35 mm reflex cameras. very often equipped with, at least for that time, convenient accessories like rangefinder, flashgun solenoid and automatic sheet film holder, could produce stunning images. Press photographers, all over the world used the Speed Graphic camera to help create a new visual style that was powerful, immediate, and often disturbing. The more you know about the old press cameras, the more you’ll respect the craft of the photographer in the past, whether they worked in the streets of Chicago in the thirties, on the battlefield in World War II in the forties, or taking glamorous pictures of the VIP’s in the fifties and sixties. The success of these Graflex cameras was not unnoticed by the competitors and they often were imitated. Some of them like Busch and Burke & James, improved the usability by revolving back and lightweight construction. The Pacemaker was the successor of the Anniversary and was the last Graphics. Two types were introduced. The Speed Graphic has a Focal Plane Shutter. The Crown Graphic has only a front shutter. Both Speed and Crown were available in three sizes: 2 1/4 x 3 1/4, 31/4 x 4 1/4 and 4x5 inches. In 1949 the versatile Graflok back was made available on all Graphics. The camera cost in the year 1958 US $ 404,40 . At that time the average wages in USA were US $ 3673,80 per year ! The light trapping of the lens standard and lens-board were of metal as was the back and the focusing hood. Striking are the hinged infinity stops, the new focusing scale and a more solid wire sports-finder. Further more a tilt was added to the rising and shifting frond. The new built in shutter release was a very useful device enabling to control the shutter without loosing grip of the camera house. The new designed multi-speed focal plane shutter was compared to its predecessor, the Anniversary, which had 24 speeds, reduced to six speeds. A switch, externally mounted, effectively governed the tension and speed from 60, 250 and 100 to 30, 125 and 500. Picture above shows the Pacemaker Speed Graphic with side mounted Kalart range-finder and top mounted tubular finder. Changing lenses of different focal length, needed wearisome rangefinder calibration. However, the Pacemaker was a great advantage comparing to the pre war Anniversary. It was a new design, utilizing war proven materials - magnesium alloys, stainless steel and corrosion resistant finishes. The new Pacemaker adhere to a 57 years old tradition had 23 new features. Graflex Advertisement announcing the new Pacemaker Cameras. New focal plane shutter with governor controlled speeds for better color photography. Body release for tripping either front or back shutter. Rigid all metal front with stainless steel U-support. Precision made magnesium backs and focusing panels. Four sided metal folding focusing hood. Unique infinity stops with hinged member that folds aside allowing free forward movement of front standard. Shutter selector, enables tripping of either shutter from one point, the new body release. Optical viewfinder with magnesium housing and improved optical system, has vertical and horizontal parallax correction. Direct reading of focal plane shutter speeds through a sealed window. Exposed metal parts corrosion resistant. Stainless steel open frame finder with parallax adjustment. Provision for use of focusing scales with wide angle lenses. When supplied with Graflex back the new improved focusing panel is included as standard equipment. Tripod socket has removable insert permitting optional use with either American or European tripod threads. In the late 1950's the top mounted range-finder with automatic parallax correction and interchangeable cams, appeared on the 4 x 5 inch only. Interchangeable cams were needed to calibrate the range-finder for different focal length of the lens. In 1947 the horizontal Graphic or Graflex back were changed into the International Graflok back. 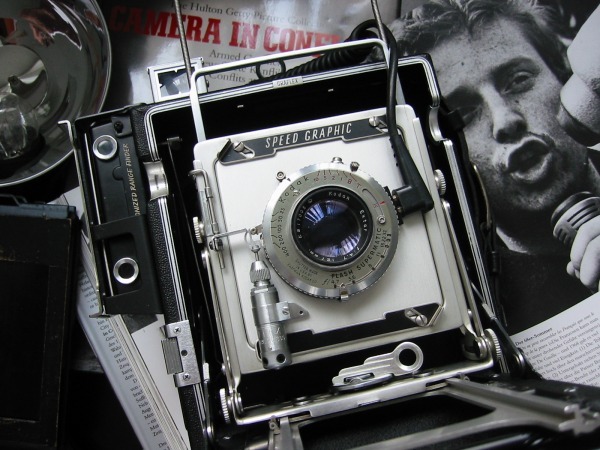 Find your way in the labyrinth of Graflex products, by clicking the links below to the cameras and the accessories such as Flash and film holders. How do I get such a camera ? How to open the camera?